This release fixes a lot of bugs and adds a new custom Token system, as well as a simple way to deploy contracts right from the wallet! To update from a previous beta, just replace the old version with the new one. The actual important data is stored in your application data folder (see readme). This new version will update your database, so the first start of the wallet may take a while. Please be patient. Note This release contains geth 1.3.1, so make sure to also upgrade your installed node as well (if you have one installed), otherwise you will corrupt your blockchain data switching between the different versions! A string representing a symbol for the token (ie. "MT$"). Those are not checked to be unique in any way. How many decimal places your token has to the smallest divisible part. For example, if you want your token to divisible by at most 100 smaller (nameless) units, then put "2". Under the hood the system always deals with the smallest unit in integers. Example: You want to create a entity with "virtual shares", with the minimum for trading is the 0.001%. Then use 100000 as the supply, your virtual company name as the name, "%" as symbol and 3 as decimals. This will result in the creator of the contract owning "100.000%" of your tokens, with a contract that can be proven will never be able to create any more shares. This example is given as an educational tool for building virtual assets on the blockchain, check your local regulation to understand how these virtual assets are considered and regulated, as you probably won't be able to legally issue real shares. Press send, type your password and you'll be redirected to your dashboard. There you'll probably see a transaction log stating that you created a contract. 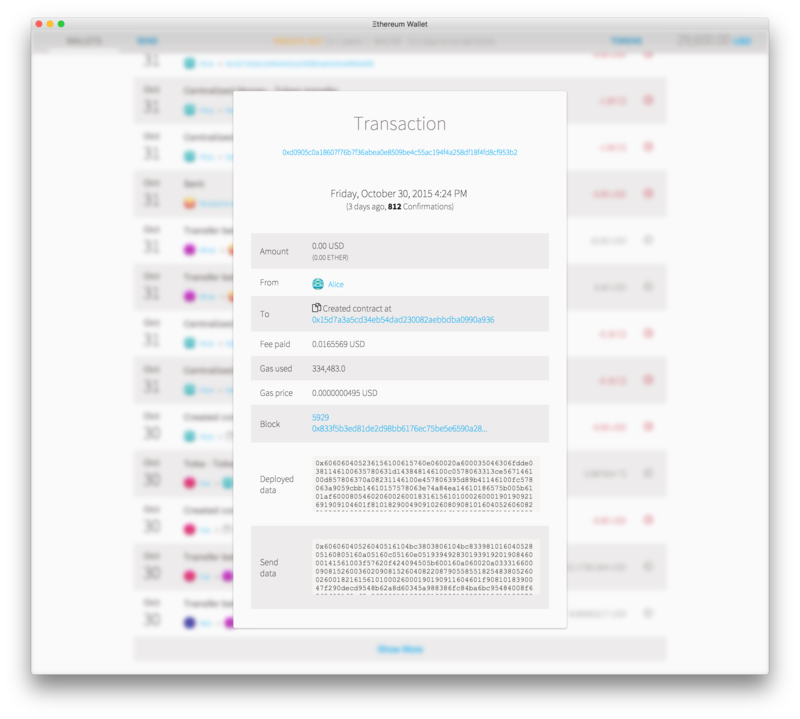 The contract address will be visible after a few seconds, after the transaction has confirmed. 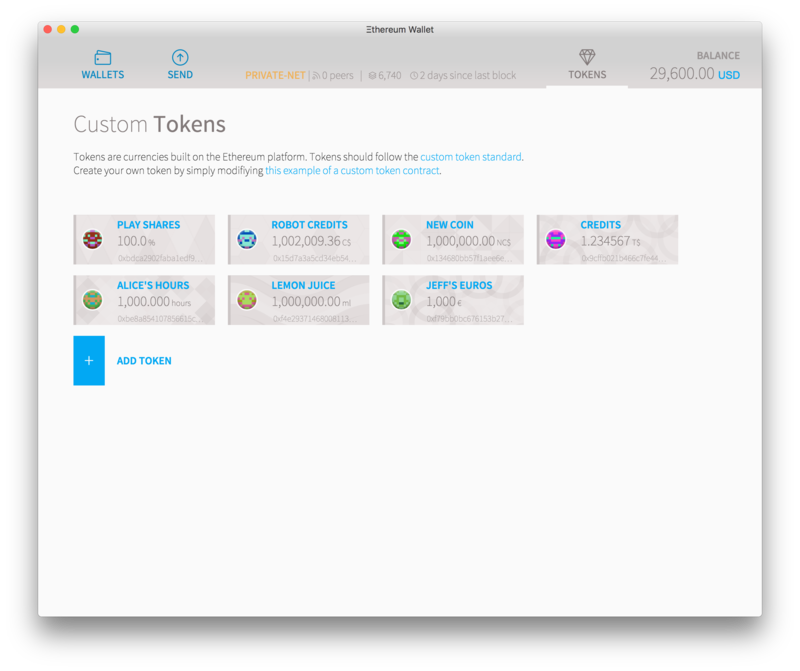 To add a custom token, click the "Token" button in the upper right. 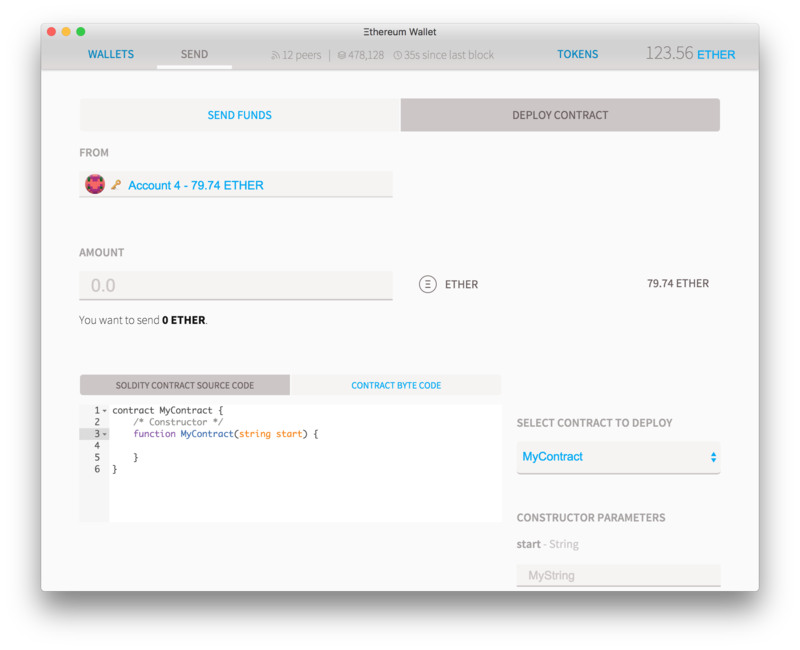 This lists all the contract tokens that you are currently watching for transactions. 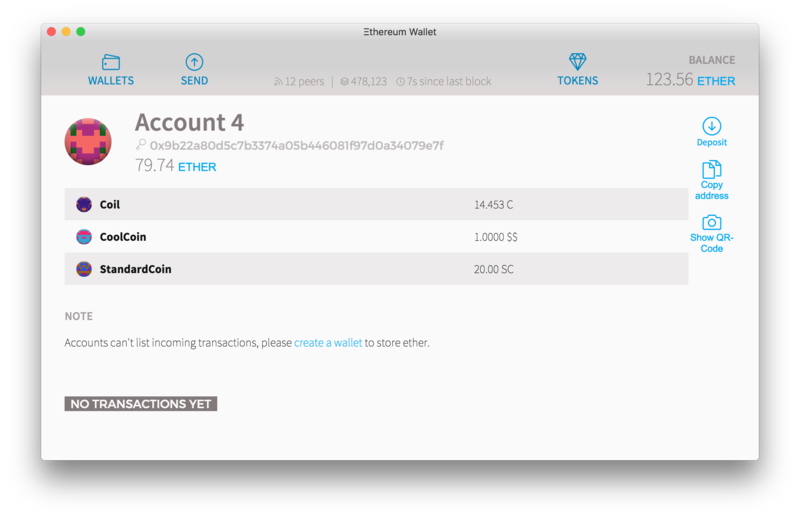 Click "add token" and then paste the address of the token you just created (or any token you want to keep in your wallet). The wallet will then watch the token and check if one of your addresses has any balance. 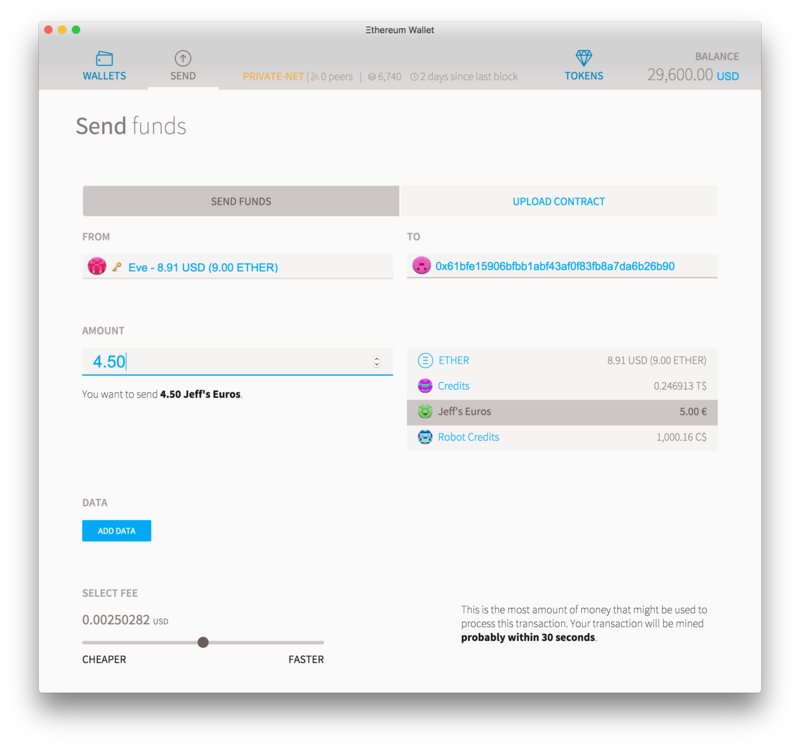 To send tokens around, just go to the send page, and pick the sender and receiver as you would do with a normal ether transaction but instead of ether, pick your token. If you don't see the token you want to send in this list, then that means that either your sender account doesn't have any of it, or that your wallet hasn't synced up. Pay attention to the token icon, as this is the unique identifier of your contract and is linked to its address. Tokens can have any names or symbols (including "US dollar" or "BTC" and other token names) but each one will have a single unique icon, this is your guarantee of sending and receiving the token you want. If you have any issues please post them to the wallet repository.